When you first start out in Red Dead Online you’ll be all on your lonesome while you complete a short tutorial segment and then an introductory mission matched with random allies. Before long though you’ll be cast out into the wild, wild world of Red Dead Redemption 2’s online portion, at which point you’re free to join up with a posse of friends and start having a blast. In this article we’ll teach you how to start up your own posse or join a friend’s in Red Dead Online. First you need to decide if you want this to be a Temporary or Persistent posse. The former means as soon as the leader of the group logs off, the posse will disband. The latter costs $200 and sets up a permanent team that’ll stick around whether individual players are online or not. You’ll even be able to name your group, establish a dedicated camp and maintain the stats for your crew’s accomplishments. Persistent posses are quite a big deal, so until you’re sure of who you want as your crew, we recommend starting with Temporary ones. You'll likely need to save up some cash first anyway. Next you can set the privacy of the group. Invite Only will make sure only the people you choose are able to join, while Open will let any old cowboy saddle up with your posse. After that you can set Friendly Fire to be on or off. This determines whether or not members of your posse can hurt each other. If you don’t trust the team you’re with, we suggest setting it to off. You’re now ready to decide on your camp arrangement. 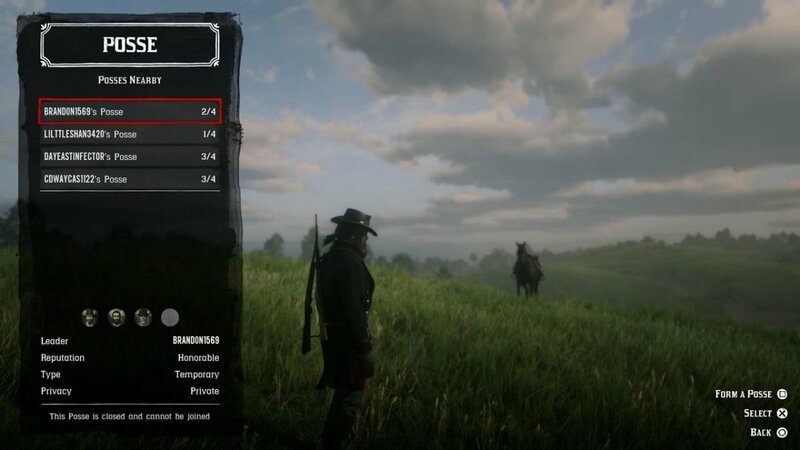 For a Temporary posse this will just be the basic camp, allowing your team to rest and change their clothes. 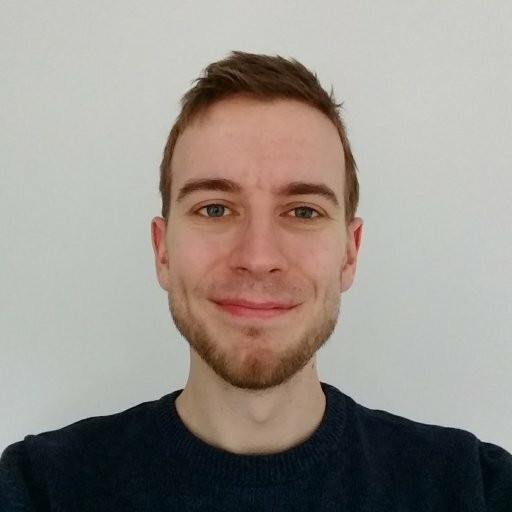 For a Permanent one you’ll have the chance to upgrade and change it much like in Red Dead Redemption 2’s single player. Either way, pick a location that’ll be useful for your team so that they can rest there easily. Joining an already formed posse is much easier than making one in Red Dead Online. All you need to do is take a look at the posses available by pressing left on the D-Pad and choosing the posse selection option. You’ll be presented with a list of posses as well as the number of players in each. 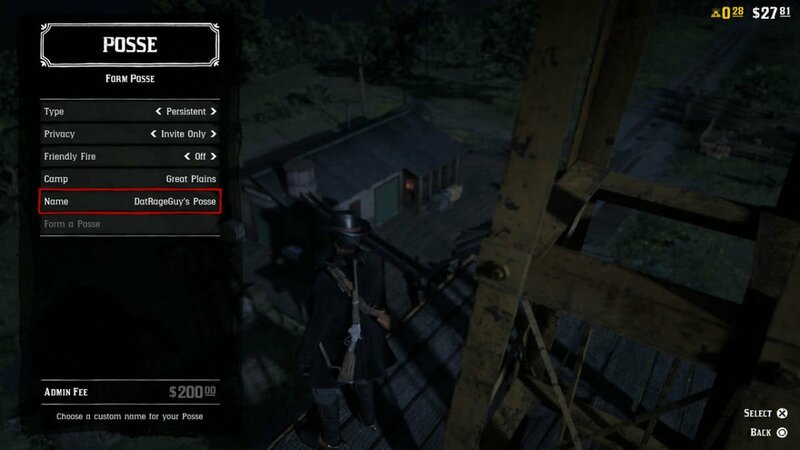 Provided a posse is open, you can now select it and join. 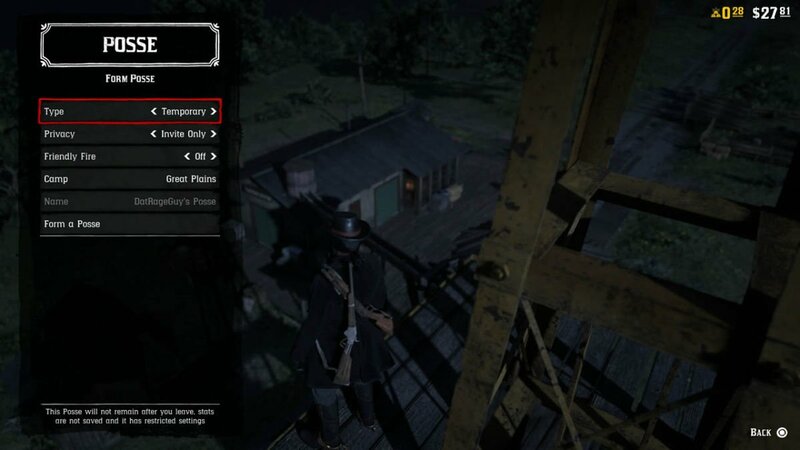 This will tell you where every member of your posse is, and team you up with the players in there. If your friends have already created a posse that’s Invite Only, you’ll need them to add you directly before you can join. That’s all there is to know about joining or making posses in Red Dead Online, so get out there and make a name for yourselves! Make the most of your time online with our Red Dead Online guides - here’s how to use Free Roam, while this guide will teach you the best ways to make money fast in Red Dead Online.